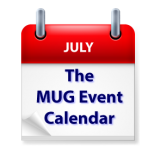 With many groups on summer hiatus, the MUG Event Calendar seems to be on vacation as well. A group in Japan will look at some of their favorite apps, a Connecticut group will look at the future of technology, and a California creative pro group will find out what it took to edit the film, John Wick. Thursday 27-Jul Cleveland Digital Publishing Users Group – Research & Your Customer’s Web Experiences: Why Care?